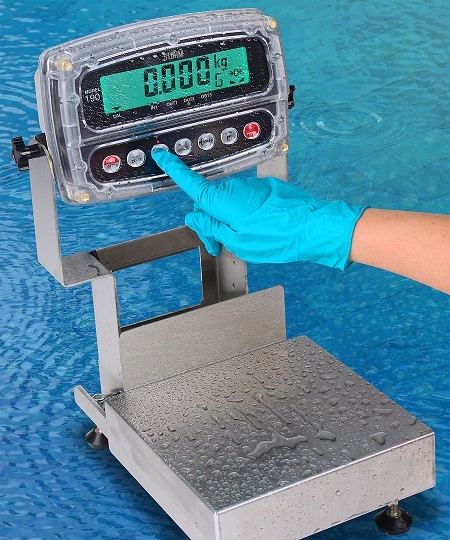 Cardinal Scale’s Admiral bench scales feature an IP69K-rated load cell and indicator, so any sensitive electronics are fully protected against close range high-pressure, high-temperature spray downs, making them ideal for the food processing industry where equipment must be carefully sanitized. The heavy-duty stainless steel base is built solidly for high-usage durability. The bright, vivid ColorZONE display changes color automatically as pre-assigned target weights are reached for efficient checkweighing. In environments that require heavy washdowns, such as in the food processing industry, the combination of water, chemicals, high pressure, and high temperature can prove fatal for electronic circuits and instrumentation. The Admiral bench scale’s IP69K rating offers the highest protection rating possible. The Admiral’s colorful 190 STORM indicator is positioned at the optimum viewing height and out of the way of the product being weighed. The display tilt feature allows the display to be positioned just right for each operator. The entire LCD display can be set to any of seven different ColorZONE colors during checkweighing. This exclusive ColorZONE feature takes the guesswork out of the weighing process. The Admiral’s polycarbonate and ABS enclosure to the weight display is watertight and allows operation in the harshest of environments while the stainless base and column construction ensure long-lasting durability. The scale’s 190 STORM indicator features four captive screws in the back panel, so they cannot be lost when unscrewed (important for food processing applications).